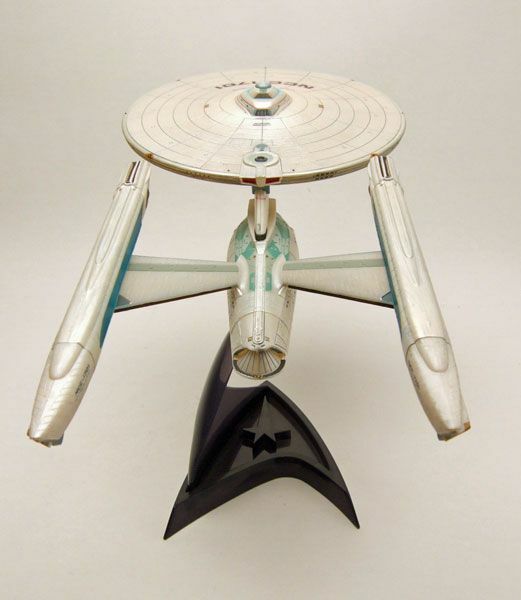 DST released this Enterprise as part of it's "Star Trek II The Wrath Of Khan" line. The first thing you notice when you see this one in person is the "pearlized" finish used on her. I personally REALLY like the look. It gives it a much richer look than had they just molded it in light gray plastic and called it a day. 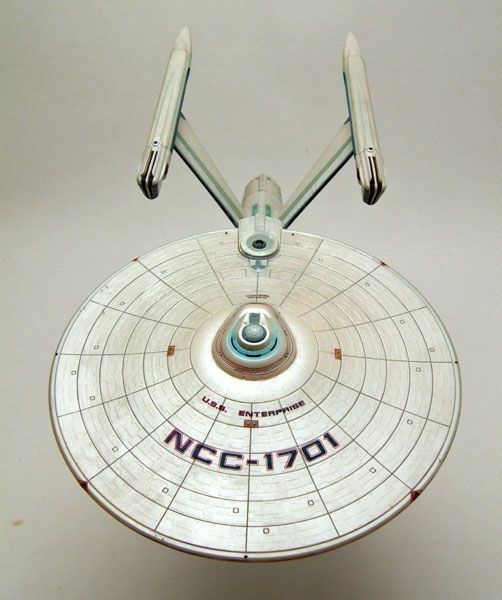 Unlike the TOS version, the movie refit of the Enterprise had a ton of little details painted onto the shooting model. DST did a fine job at capturing all of these little bits, and the paint on my original release is very clean and straight... which was probably quite a task with all these little details (more on this later). Just like all the other DST ship releases, this TWOK version includes an interchangeable battery cover and stand for display purposes. 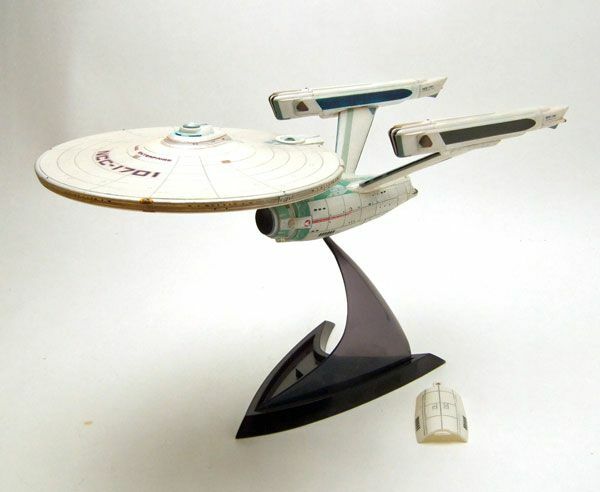 I like the style used here (ball-and-socket) versus the pegged stand used on the TOS ship. The stand feels sturdier and I worry a little less about these taking a dive off my shelf. 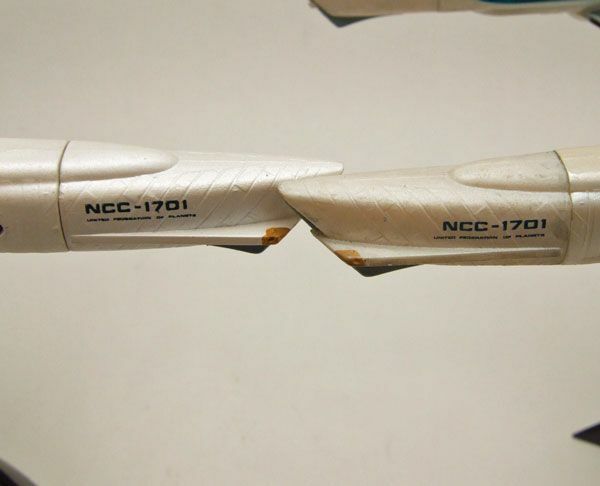 Not a huge difference, but I believe they used a thicker paint on the nacelles to block some of that bleed a bit. Now while that's an improvement, I have to say that the new release isn't quite as nice as the first in the paint department. The newer release doesn't have as much sheen as the original. The pearly finish is still there, but it doesn't have the luster of the original. It's tough to tell in the pics, but some of the detailing lacks the sharpness of the original. Instead of sharp edges, the lines look a little more undefined and a bit sloppy. 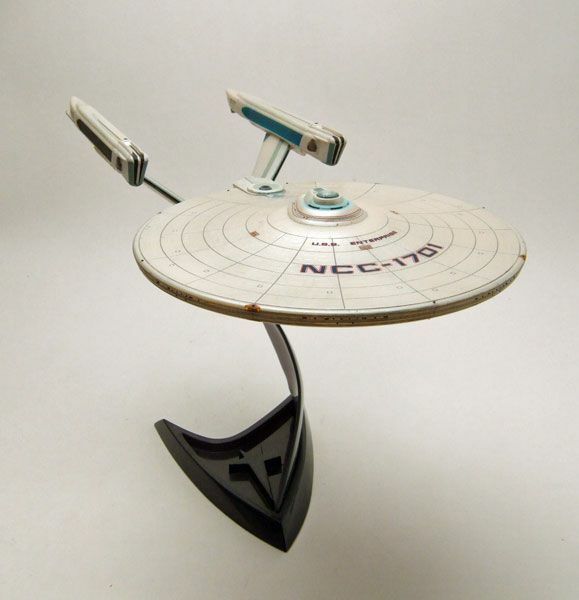 You can see in this pic what I mean by the nacelle now having a thicker paint. 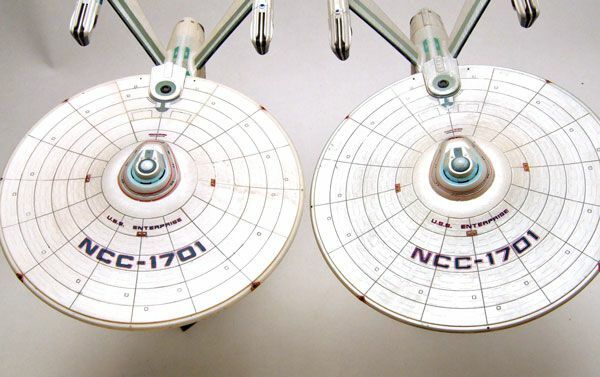 Notice the difference in the nacelle colors there. Again, while that's an improvement, you can also see what I mean by the details being a bit sloppier this time around. 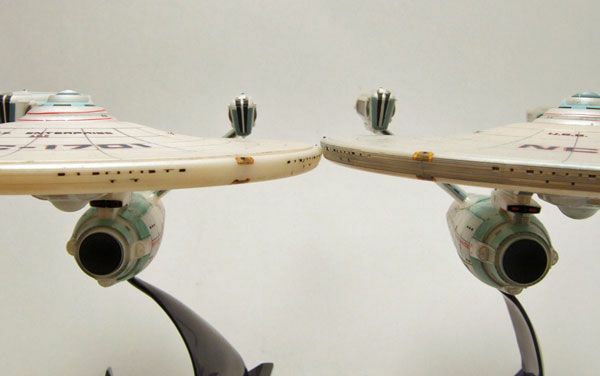 The small brown marking at the edge of the nacelle looks sharp on the original, but looks more like a brown splotch on the new release. I should also point out that all of the text used on the new release lacks the definition of the original, even though they seemed to have use a slightly larger text this time around. 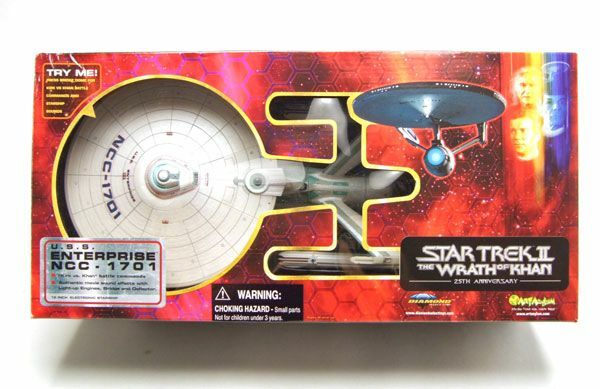 Some details seem totally omitted on this new release as well, like the lines encircling the saucer section. At first glance I also thought that the photon torpedo emitter area was missing it's red paint detailing, but upon further investigation it just appears that the paint app is muddy and the red just got lost in the black. Maybe I'm being a bit harsh on the new release. If I didn't have the original to compare it to, I'm sure I would be totally happy owning the newer version. Any way you cut it, this is a fantastic toy of a beautifully designed ship. If you have a first release, you don't really need the second issue, even with the lesser light bleed. If it's your first time snagging one, even with the little downgrades here and there, I think you'll still be happy owning the reissue. That is a beautiful looking toy, I may have to hunt one down, I missed the first release. Where did you find the newer release? 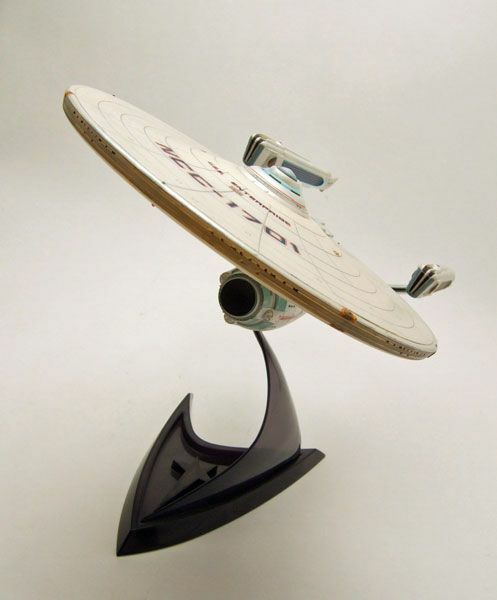 Your blog is really about the best of the Star Trek product blogs, or Trek blogs of any type! Top-notch photography and design. Keep up the good work! Thanks Fred! I really appreciate that! The feeling is mutual!